When I work with clients, I generally start my sessions by asking lots of questions to find out what their issues are and what they want to achieve through the work we’re doing together. Those Well Formed Outcome questions are a therapeutic tool per se, as they’re designed to help the client looking at their issues in a different way. By challenging their generalisations, reconnecting with the deeper meaning behind their deletions and distortions, they already start the change process. The questions I ask my clients though are more orientated towards their internal processes, thoughts or feelings. And the question that comes to my mind when they get stuck in the “I don’t know” trap is “but if you don’t know, who does?” And often when we surrender to that answer we end up not truly taking responsibility for ourselves nor taking control of our life. Have you ever been in a situation when you meet up with a friend and when they ask you “so where do you want to go?” you find it easier to tell them “I don’t know, what do you think? !” rather than make the decision? Even though surrendering the choice doesn’t have major consequences in this situation, often we replicate that behaviour in most areas of our lives. In any case, what is more useful? Staying stuck or exploring the answers, get the opportunity to learn something new about yourself, and perhaps decide to do something about it? I know sometimes that the answer can be scary. Yesterday I was working with a client who has got anger issues. And when I asked him “what are you angry about?” he kept repeating “I don’t know” as you would have guessed. When I gently challenged him on that, he recognized he was very angry with his father and felt really guilty about it. But after a while he accepted those feelings, and was ready to start working on them. Making another step forward on his personal journey. I think we can learn a lot about ourselves and our unconscious patterns by seeking the hidden answers behind that question. It often reveals our limiting beliefs and fears, and by bringing them back to consciousness we can then begin to work on them rather than being controlled by them. Any thoughts on that? I was in a state of stuckness plenty of times! I could say that I wasn’t scared from the answers, because literally I was blind for them:). 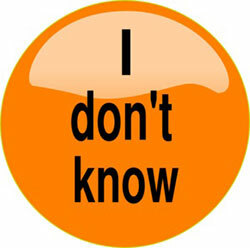 Even I was asked or I asked myself many questions the answer was the same: ” I don’t know”. identify with the state of stuckness being it, I cant think and my mind is blocked. I think that negative emotions behind the answer blocked the mind to think properly. Even I ask my self thousand time challenging questions the answer is the same. I think that the way out of “I don’t know” state is to acknowledged it, to accept it, and to step back and dis-identify from it. Next Next post: NLP or Hypnotherapy?